Search for the best flight prices from Stansted Airport to Tivat Airport. Compare prices, book today and save money with Stansted Airport. A large port city on the coast of Montenegro, Tivat offers a blend of cultures as it sits on the border between the Eastern and Western worlds. With an eclectic mix of white Adriatic beaches and picturesque Eastern-European mountain ranges, a day in Tivat can start with a morning surf in balmy heat and end in a ski down wintery slopes. As the entirety of Montenegro is just two thirds the size of Wales, you’ll be able to see many of the country’s landmarks in a single trip, however even after months of exploration there’s always more to discover about the historic country. With slightly cooler summers and warmer winters, Tivat’s climate is mild for the Adriatic so you can be sure conditions will be comfortable at any time of year. Whenever you visit, the first stop on every traveller’s journey should be to the small coastal village of Sveti Stefan. 3.7 miles southeast of the town of Budva and situated on a small islet, the gorgeous village showcases everything that attracts visitors to the Adriatic including a rich history, breath-taking vistas and delicious cuisine. As Montenegro’s tourism industry continues to grow, Tivat and other cities are offering a wide range of accommodation – catering to both frugal backpackers and those looking for a little luxury during their visit. Tivat plays host to one of the nation’s top hotels, the Regent Porto Montenegro, which boasts fantastic views of the city and a unique Renaissance Venetian architecture - making it a great choice for those who are looking to splash out. Alternatively, you can stay at the Aman Sveti Stefan which offers incredible accommodation in the heart of the small island village and a rare glimpse into the local lifestyle. Tivat and its coastal neighbours offer a wide range of shopping experiences, with many markets stocking a wealth of imported goods. However, if you’re looking for big-brands then you may want to consider visiting Podgorica and its four shopping malls; Delta City Podgorica, the Bazar, City Mall and the Mall of Montenegro. There are also regular coaches available to Croatia and the city of Dubrovnik, which has a large shopping district. With a diverse geography, Montenegro’s cuisine is both rich and varied, fusing flavours from the East and West. If you’re a meat lover, a visit to the mountainous village of Njegusi should be on your to-do list. Njegusi is prized by locals and gourmets for its signature prosciutto, which is said to be the best in the world. For a completely different taste of Montenegro, black risotto is served in many ports and combines white wine with nutmeg and cuttlefish ink to create a distinctive flavour. There’s also a vibrant nightlife, for those who fancy something a little wilder, in most of the major cities including Tivat, Budva and Kotor. Running from late December till March and translating to ‘hot winter in the hills’, Vrela Zima U Brdima is a series of events that keep spirits high in Montenegro throughout the winter. There are near-daily events including performances from pop stars and celebrity guest appearances. If you’re visiting with kids around this time you can find many artistic and sports events to enjoy with just a little pre-planning. The Budva Music Festival, renamed to Sea Dance in recent years, is the biggest musical event in the southern Adriatic, with many performances from the top acts in the European music scene. As entry costs about the same as an evening meal, it’s an experience you can’t afford to miss. Celebrating the history of the town of Kotor, Boka’s Night is held on the 3rd Saturday of August and is a highlight of the summer calendar. Boats in the bay of Kotor parade as the locals decide which deserves the prize for best decorated. After the prize is given, there is a celebration held in the Old Town with food and an incredible firework display. With a varied history and geography, Tivat offers plenty to do and see. Take an afternoon out in the Adriatic ocean by hiring a boat from Tivat or one of Montenegro’s other coastal towns. With the chance to stop at many smaller ports and beaches, it’s a great way to see the nation’s coastline. The second deepest river in the world, the Tara River is known as ‘the wildest river in Montenegro’. Overcoming its riptides and rapids is a fantastic way to experience the beautiful landscape of the region, and a must for adrenaline junkies. Getting on the water is easy as there are many companies to book within the area. An impressive piece of architecture and a sacred monastery of the Serbian Orthodox Church, the Monastery of Ostrog is carved into the side of the large rock of Ostroška Greda. 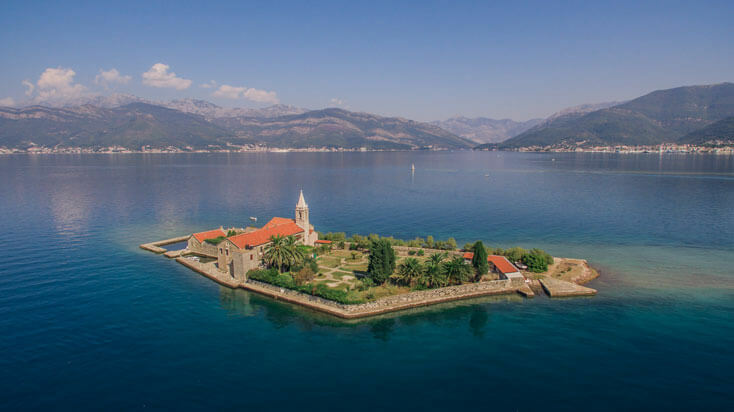 Well worth your time, it’s a popular place of pilgrimage in Montenegro and welcoming to all faiths. Regular coach services run between the monastery and the city of Podgorica 50km away. With 25 hairpins turns, the Kotor-Lovcen road is the perfect test of any driver’s skills. Around 17km from Kotor, the road runs through the mountainous Lovcen National Park to the peak of Lovcen and the reward for every daring driver that completes the route, a view across the entirety of Montenegro. One of the oldest settlements in the region, Stari Bar is a small village around 5.7km from the city of Bar that was founded just under a thousand years ago. Claimed by several countries over the centuries, Stari Bar showcases architecture from some of the most influential empires known to man. The village is the perfect place to explore as every inch is steeped in history, including several generations of old ruins and an ancient olive tree that some claim to be over 2000 years old.